It's typically a good sign when I don't post often. The daunting task to be thorough, often has me putting this off just to lead to a longer post. I'm sure many out there see the Facebook posts about updates, go to the blog and take a quick scan for the basic facts simply because my posts are like short chapters in a novel. But in the words of Clark Gable, "Frankly my dear, I don't give a damn." Better to be thorough to remember the impressions and experiences as I/others read than to use brevity. I had a relative once tell me that short often posts drive the most traffic. I replay the previous quote. Take it or leave it, this is primarily for my boys. Their memory of this experience will be limited with moments of clarity, but their very personalities have been shaped by it. I have seen from a young age their ability to adapt to new people and situations develop because of their surroundings. It's quite remarkable really. What might seem daunting to an outsider for a child to experience: the fragmented days, limited time with their mother, limited experiences in sports or other activities, multiple caregivers, etc; has turned out to be a pretty adaptable experience for them. Anyone who has seen our baby Charles this year has seen a true daddy's boy if I must say so myself. The kid absolutely goes bonkers when I am in view or in audible distance. Last Wednesday July 22, we had an early morning procedure and had to have our kids watched overnight. As we dropped them off at my brothers home that night, the boys and two of their cousins were doing chalk art. As he was sitting on the sidewalk watching us pull out of the driveway, he had a look of acceptance on him. 'It's okay, I'm with my brothers, and these other little people seem familiar to me.' There was no longing or waddling to the car, he just looked at us as we said goodbye to him...and it was past his bedtime. I have seen him take comfort in his big brother's presence over the months as he is moving from being a baby into a toddler. Jack often says, "He just loves you so much dad. Every time you are in the room he just wants to be with you." I have some serious adjusting to do about 10-15 years from now. For now, I am soaking it up. While he used to come after me when he heard or saw me, now I can yell to my boys asking about Charles and he will continue to play with them. Sometimes this is for extended periods of time. The twins have also grown with this experience. They take an active role at looking after him while playing. They watch what he is doing, attempting to put in his mouth and we can hear them parenting him from a distance. All 3 are building a bond that will be with them forever. That said, it's not all peaches and cream; Ben got in the car and just smashed a hat against Charles face the other night. After asking why he did it, he gave a typical 6 year old response with a shrug of the shoulders. A few weeks ago while playing with the hose in the back yard, Jack pointed it right at Charles face after he had been laughing at the random splashes. It kinda reminded me of that guy spraying the kid in Billy Madison. At times I feel like a coach parenting these boys, raising my voice telling them things like all we have is each other, motivating them, telling them this is forever and that friends will come and go. I also took a line from my cousin Spencer, "I've never been a dad, and I am just learning, just like you." It seems to even the playing field when I am upset with them. I do notice the twins are pretty tender at times. They want my attention more than ever right now. One time at a family camp out, Ben was at my side telling me he wanted to play with me instead of doing the activities. I was preoccupied with something else and encouraging him to join in the activities and he burst into tears; "But I just love you so much!" he said. I was crushed. Jack constantly is asking to play or telling me about something his brothers said or did. He too will break down at times. Tonight he burst into tears when I left to get some prescriptions. "But I wanted to play pass!!" He was dying to pass the football. He and Ben seem to understand and take what they can get. I always try to give them the attention they need. The common thread is it usually happens when they are hungry or tired. But I have the clarity to recognize that it also may be their way of expressing what they are going through. I ask them a lot of questions about what they think about what is going on, if they are worried, if they have any questions. They pray for her every morning and night. Sometimes its to get off oxygen, sometimes its to not get cancer again, and sometimes its to not get sick again. We talk a lot about mom and the therapy she is getting. We are often asking them to be quiet and talk softly. They are still loud as hell. Julie texted me she needed a muzzle for them the other day. Lately she's been threatening to carry around a squirt bottle to spray them in the face when they yell. We are top notch parents over here...but after chemo, her hearing is sensitive. All in all things are pretty normal on the parenting and family front. About a month and a half ago, Julie went through her last round of chemotherapy. It was one we were reluctant to do. The blood work had looked good since the second round, and there was no empirical data either way regarding the outcomes if we finish what would be the 6th round. It was a choice between two bad deals. Finish the rounds and possibly do further damage to the already delicate lung graft, or call it and risk the cancer coming back with a vengeance. We chose to finish because of the lethal nature of this aggressive fast growing cancer we had seen once before. Julie's Plasmablastic Lymphoma grew in Julie in a matter of days when it came back just 3 weeks after the removal of the mass from her bowel in January. We had experienced that vengeance and wanted to limit the possibility of that happening again. They luckily did an 80% dosing and the hospital stay lasted from Thursday June 4 to Tuesday June 9th; 5 days instead of 8. This thread was followed by several imogis indicating crying from Julie. I appreciated the gratitude she shared with me though. It was always a stress to call one of the many people willing to help us. We usually had little lead time because each day and each hour brought different symptoms to Julie. That week early in June, Julie mentioned she felt like she had pleurisy, inflammation of the lining of the lung, in her lower left lung. 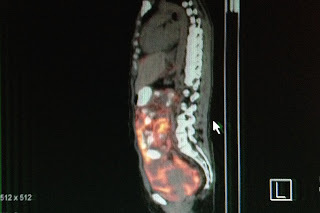 We found out what it actually was 6 weeks later after her first post chemo PET scan. I will get to that in a minute. She was very nauseous when she would sit up that week, so she spent much of her time in bed. These weeks after chemo were always challenging for me in balancing the regular work life with the needs of Julie. The juggle of it all always let up after a few days, but at times, there were text threads that were not so peachy as the one I just posted. As I mentioned in a previous post, anyone who pulls the threads in the future, may wonder if I was doing anything for her. Instead of texting back I would just get up and take care of it. That said, when I wasn't available, you can see it in the thread and Julie wasn't shy about it. Many times when it was too much to juggle, we would have one of our mothers, aunts or close friends come over. The service they have rendered to us and to Julie has been truly angelic. What happened during her nadir that weekend was something that brought a lot of encouragement to us with regard to her lungs. That Saturday June 14, she was off oxygen for about an hour and her O2 Saturation was between 92-98, and on Sunday she spent 3 hours off oxygen. The reason this was so encouraging, is during the nadir, you have no inflammatory response because there is no immune response. The fact that she was saturating well told us that the issues with her lungs were largely tied to inflammation and not scarring or infection. This was very encouraging and was a fact we have fallen back on in the following weeks. She was rightfully paranoid and a hypochondriac during this time since she was so susceptible to infection. We didn't need another fungus or infection to further bring her down. Several times during the treatment I would spend many days out on the couch. Not because I was in the dog house, but because "you're such a disease Kevin!" (Home Alone 1990). We had to mitigate risk. RSV was a doozy and postponed the second half of chemo nearly 2 months. Even though we were done with treatment, we didn't need any more set backs or risks added to her plate. I was showering the kids constantly, they were locked out of her room, but occasionally she would come out with a mask on to see and be with them. She had to receive another transfusion that Saturday and luckily it dropped her heart rate to a more comfortable level around 100. Still, she was burning everything she was taking in. We were out on the boys first real trail ride on bikes in Emigration, with Charles in tow...or Bjorn. The next Monday she had her blood checked again. Her white blood cell count was less than 0.02 white blood cells per microliter (mcl). Normal is between 4.5 and 10.0/mcl. She had no way of fighting anything off if she caught it. We were at that point of constantly being checked and occasionally getting blood or platelets. She was on the borderline of receiving platelets that day. That night just before bed she started to have a nose bleed. Without platelets, there was no way it would stop. We put tissue in, pinched it, but frankly we only had about 20 minutes to see if we could stop it. We headed to the ER just after 10:00 pm. We knew we needed platelets, but anyone knows that a visit to the ER is a minimum of 6-8 hours. It was busy. We got the results from her blood draw just after midnight. So we spooned on a 2.5' bed till around 3:00 am when the platelets came for transfusion. We made it home at 5:00 am to wake my dad after he had been with the boys. That night sucked. After a day recovery from an all nighter but without any action Julie woke up Wednesday morning June 17 in excruciating pain. The center of her chest and her lower back felt terrible. It was the most pain she remembers experiencing in a long time. She mentioned to one nurse it "was worse than childbirth." Initially we wondered if it was a heart attack. I cancelled my appointments and rushed her to the hospital. She was weeping the whole way. It was so painful for her to sit down that she was holding herself up with her hands. When we arrived at clinic, they took her vitals, and bloodwork and found it was a common side effect of the Nulastin shot she was given when she finished chemo the week before. This shot is given after chemo to assist the body in reproducing it's own white blood cells. When it kicks in, it comes back fast. The white blood cells are produced in the bone marrow. Any bones that have a lot of mass i.e. the sternum and the pelvis, produce more bone marrow. The pain was from the pressure of the cells rapidly reproducing. Ironically, Claritin D can mitigate some of this pain in an off label use. Julie had been taking it for fluid in her ears probably caused by all the normal saline she was given during therapy. Since no one told us there was an additional reason she was taking that drug, she discontinued it when the inner ear fluid seemed to dissipate. Julie is always looking to reduce the amount of pills she needs to take. She has no problem taking pills and is extremely compliant, but if there isn't a clinical benefit, she requests to come off it. She was re-admitted that day. I just remember her standing at the bed in the infusion clinic because it was too painful to lay down. She was so weak she could barely stay up. Once the Delaudid arrived for pain, she was able to lay down and finally rest. As with many stays, once I left, she sent me a list to pack a bag. That night I sent it up with her dad so I could spend some time with the boys. 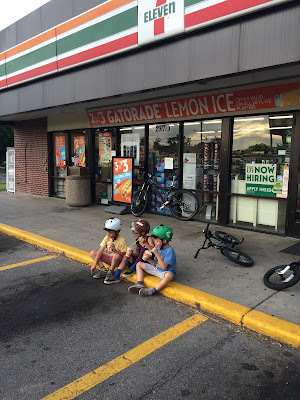 We decided to make a 7-eleven run on the bikes for slurpees. It's a rite of passage really. She needed another platelet transfusion on Thursday, and another on Friday along with a RBC transfusion. The week since that last chemo treatment, she had had 5 transfusions of blood and 4 transfusions of platelets. 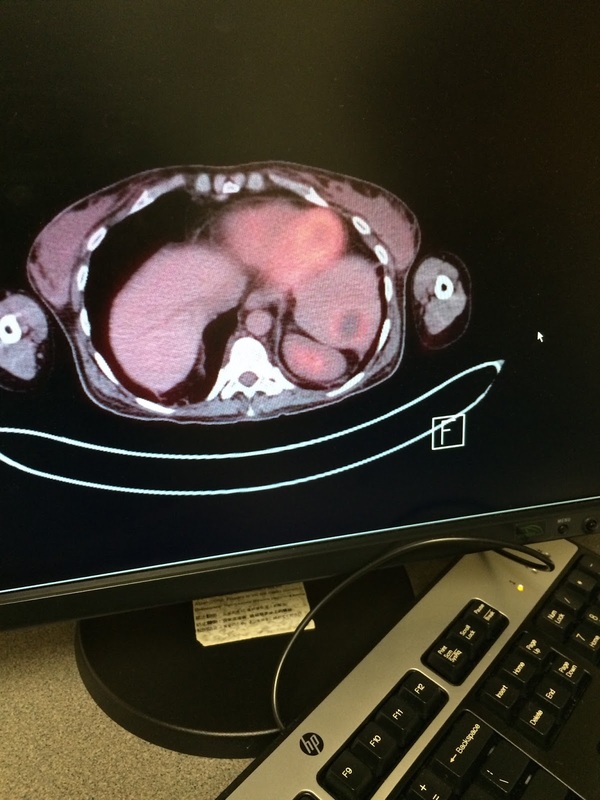 The silver lining is there was no longer any sign of bacteria in her blood or lungs. She was discharged that Saturday June 20. There was a going away party for one of our friends in the hood and Julie wanted to go because there would be no kids there. As she rested in the afternoon, she told me she didn't think she could even get up and get dressed. I told her she would be glad she went and that even if we just went there and said hi to everyone and left that would be fine. Julie is always worried I am going to want to stay too long. I would sleep over at peoples houses if it wasn't super creepy. I love a good party. She mustered up the strength to get ready and go. We ended up staying there for 3 hours. She was so glad we went and truthfully it was me that said it was time to go. This was an anomaly. It was great to see her talk with so many people who have been thinking and praying for her. It was inspiring to see them and to be lifted by their encouraging words. Each day and each week there are small feats of accomplishment like this. The road is long, but looking back we can see improvement. We have had random set backs not related to the chemo. That Sunday June 21 she was nauseous from the sheer amount of pills she had to take. Sometimes they get stuck in the esophagus. She again mustered up the strength to go to her brother's wedding shower. She was glad she made it and it was great to be encouraged by her family members. Over the next few days she was still very weak and very tired. I have several texts where she asks me to check her blood sugar. I remember checking it and then getting the needed OJ or food or insulin to make adjustments. She was just so drained that week and she wasn't able to hold anything in. As always we were in contact with the clinic and on Tuesday that week we were taken to the Acute care clinic for fluid and some testing. We spent much of the day there and the infectious disease doctors came in and wanted to admit her. She was getting IV antibiotics at home and we figured much of the gut issues she was having was from the prolonged use. We pushed back a little bit and they conceded to let us go home. We were just worried about getting another bug at the hospital. Turns out we were too late. The next day on Wednesday they called her and let her know that a culture came back positive for C difficile enterocolitis, a gastrointestinal infection. Most likely she got it at the last hospital stay. I rushed up to Huntsman to pick up some heavy antibiotics just before they closed that day. She seemed to react well to the meds pretty quickly. Looking through our texts together, she continued to parent, request food, help with meds, using the Airvo high flow nasal cannula, or ask for chest PT to pound on her chest. Chest PT helps break up any congestion, and is therapeutic for her as well. I also found several grocery lists and prescription lists sent late at night when the kids were in bed. Other set backs included more indigestion, possibly related to the C Diff, but more likely related to her not taking Miralax regularly. It is extremely discouraging for her when she has pain or discomfort amongst the low energy levels. At times she has told me she feels like she is losing the fight. Other times she is just feeling bad she can't do more with the family and that she is holding us back. I assure her this isn't the case, but I don't help the situation when I ask her if she feels up to doing different activities. It is sometimes something as simple as going to a park or up to my parent's cabin 15 min away. I do it to push her along, and often realize it is discouraging her since she feels she has to say 'I can't, I'm sorry.' I really don't mind when we can't do these things, but it is a burden she lays on herself. She also feels bad since she doesn't have energy to entertain the boys. Anyone with little boys knows they are full of energy and stories. I often tell her that I have had a lot of peace about her long term outcome; that she has to look for small incremental improvements to mentally help her along the way. Being a caregiver is a process. Learning how to motivate without discouraging is a skill I am continuing to refine. Julie's heart rate continued to be high towards the end of the first week of July and her Oxygen dependence was around 3-4 liters. She suspected she was fighting something based on her past experience. She had had no sign of bacterial infection in her lungs though she was on an antibiotic as a prophylactic, the C Diff was being treated with antibiotics, and she was still on an anti-fungal medication from a fungus she had caught in between chemo treatments. There was no explanation as to why she felt so much discomfort, and pain at times. She spent the day getting ready for her brother's wedding on Friday July 8th. She was able to have pedicures, have her real hair wig styled, and received a few makeovers. That day was a long day, but she looked great. It also made her feel good to get ready again. She had no eyebrows and no eyelashes so she wanted to get the makeovers. We had a great night at Matt and Whitney's wedding. It was so good to see happiness in this family's life. They deserve a break and we are so proud of Matt and Whitney. It was a beautiful ceremony. We hung out all night at the same table and Julie was a trooper. That Saturday after the boys and I spent some time up Little Cottonwood with friends, we hit our first movie with the family. It was fun to do something normal for a change. Psychologically, the more we do things outside our home, the better Julie seems to be. The balance is not wearing her out physically. When she climbs stairs, her legs still buckle. The lung transplant team had her on 40 mg of Prednisone after chemo to help and late in June they decided to start to taper her off 5 mg/week. Prednisone gives her energy, helps with inflammation of the lungs, but it also makes you put on water weight, and wastes away the muscle after prolonged high doses. Some of her weakness is from the chemo, but some of it is from the wasting of the muscle. Every weekend when she drops down, she immediately has a few rough, low energy days. These are the days she is so hard on herself mentally. Each time I have to remind her how she felt the day before the dose drop. She has been adjusting well to each dose drop and her oxygen dependence only goes up the day of the drop and then normalizes. Its a good sign that she is adjusting. On Tuesday July 14, Julie had the long awaited PET scan to see if the chemo worked. We had to wait 2 days for results. On Wednesday she had her 3rd Pulmonary Function Test (PFT) post chemo measuring her lung function and x-rays of her lungs. Things are still unchanged. She is at 24% (FEV1), lower than where she was with her diseased lungs before transplant just 4 years ago. Her lung capacity is climbing however. It is around 65% (FVC) and she started chemo around 90%. We believe that much of her lung function is influenced by her sheer weakness. If her muscles have atrophied and need to be built back through rehab, so does the rest of her body including the breathing muscles like the intercostals. We are also encouraged that she recovers quickly when her oxygen desaturates from being active with too low flow. Thursday July 16 we saw the Transplant team first. Her pulmonologist came in the room like Kramer. "You have an abscess in your spleen." The results from the PET scan were back and she pulled them up. She had already spoken to our oncologist, and they were going to try and take a biopsy that day. It was the only thing that showed up on the scan and luckily it was being contained by her immune system. It looked like a dark circle with a glow of inflammation around it. Its in the lower right side of the picture. They didn't know if it was infection, fungus, dead lymphoma, or lymphoma. The latter was very unlikely. But this explained the pain in the lower left lung she experienced that felt like plurisy in early June. They didn't see it on any of the CT scans in May and June, but in retrospect when looking back they could see it on the CT scan's done in June and early July. In addition, the x-ray showed some air trapping in the small airways. Sometimes this can be from scarring of the bronchioles, and sometimes just from inflammation. The fact that albuterol, a brochodialator is still helping her is a good indication it is inflammation. We grabbed some lunch and headed to the Oncologist to see what she had to say about the scan. We already knew it looked good, but we looked forward to her educated opinion of how things looked. As we sat in the waiting area on the 2nd floor of the Huntsman cancer hospital, we reflected about the mornings there in complete agony; throwing up, pain, and just all out discomfort. It was sort of weird to be sitting there without any noticeable issues. When her doctor came in to talk to us she asked us if we wanted to see the scan again. We said of course. She went through it and at one point said, "Other than the abscess, your scan looks perfectly clear." It made our day, and apparently hers as well. We had something else on our mind now, but we enjoyed the good news. It was so nice to put that behind us. That said, we are only about 60% of the way through this overall struggle. It will take another 6 months to feel better again. At least it only gets better from here. The next Wednesday July 22 we had the biopsy. The radiologist couldn't give any results at the time, but he said it was not a liquid. That most likely rules out an infection, and leaves the possibility of a fungus, or dead lymphoma. Live cancer cells are unlikely since the area was not lit up like it was on the scan here taken just before chemo in late Feb. The intensity of this picture is turned way down because all the activity would have it white if it were the same contrast as the picture above. 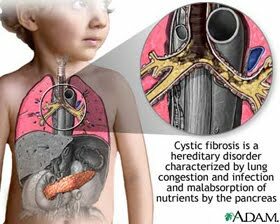 If it is fungus, it will be somewhat of a relief since the fungus she had in her system when she was undergoing chemo was thought to be in the lungs. Having it contained largely in the spleen would be a blessing. Fungus can create a host of issues if found in the lung and not treated early. We know one transplant patient that passed away from this. Since Matt and Whitney's wedding on July 8, Julie's hair, eyelashes, and eyebrows have all grown back in. They were only gone for about a month. She has a solid 3/16" of hair again, and there is a lot of it. It's amazing how good she looks from this added hair. Since writing this we received the preliminary results of the PET scan. It was just dead tissue. All the tests so far have shown negative for fungus, lymphoma, or dead lymphoma. Whatever it is, Julie's body contained it and it is going away. Keep praying for Julie to get her strength and health back. We are hopeful she can repair and rehab her lungs. It really is a slow fight so you will have to be patient. We are just so grateful for the prayers and support we have had. As I have said many times, there is no logical explanation around how well we have done through all of this other than the spiritual and physical support that has been so selflessly given to us. The odds were stacked pretty high against her (once again) and she continues to push through them. Setbacks will come and go, how we face them makes them go a lot sooner. God Speed everyone. I love reading your updates and I'm so glad to hear the good news and that things are getting better. You are truly an amazing family. We will keep praying for a quick recovery and continued healing! Thank you for your heartfelt and honest updates. I feel close to you guys because of it. My heart is happy each time I see a "like" or comment from Julie on Instagram. She and you and champions in in my life. We will continue to send you prayers. I was a nurse on 2 East before it was gone. I took care of James and Julie. They were among my favorites.